When providing private traffic control services, Roadway Construction Service covers a lot of ground. And not just in the physical sense. Private traffic control services require the coordination of many elements. Expertise, experience, and insight are mandatory to keep these elements working in sync. If even one part is off kilter, the entire operation is compromised. Think of a professional athlete in a slump. The entire team suffers. We don’t allow that. What are the key elements in our traffic control operations? All of them. Everything we plan, deploy, and organize is essential for success. Consider, for instance, the deployment of road barriers. Often utilized for lane closures, road barriers are indispensable for maintaining work zone or event site safety and smooth traffic flow. To ensure these requirements are met, Roadway Construction Service has developed a complete road barrier system second to none. We analyze each project from top to bottom, identifying the proper number, type, and position of every barrier deployed. For example, we often utilize k-rail barriers (a.k.a. Jersey Barrier) as protection against traffic intrusions. But which type of “Jersey wall” or “K Rail” should be deployed? We determine the answer, based on careful of assessment of project scope and conditions. There are in fact two types of k-rail – plastic and concrete. And it’s not just a tossup. There is a vast difference between plastic and concrete road barriers. The former is lighter and more portable, making it ideal for temporary assignments. Once positioned, the barrier’s inner chambers are filled with water to provide weight and strength. The heavier concrete Jersey wall, on the other hand, is employed for long-term projects. In any road traffic control scenario, what takes place before deployment is just as important as what takes place during. 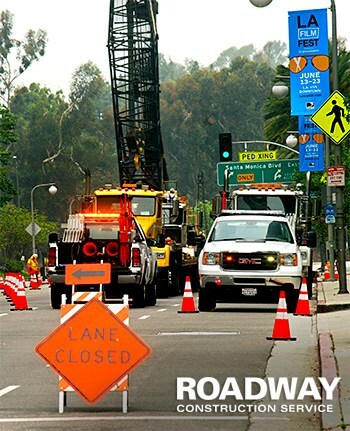 For Roadway Construction Service, the preparatory steps are numerous. We’re pleased to say that we handle all of them with uncommon finesse. Just look at our acquisition of traffic control permits. Oh yes — you don’t just haul in equipment and personnel and start closing lanes. You must secure vital documents such as a street closure permit. This means official authorizations must be obtained. In this department, you can count on flawless results with Roadway Construction Service. Credit our vast experience and long-standing relationships with municipal decision-makers. Because of these two factors, we routinely cut through bureaucratic tangles and get quick decisions. In record time, we secure all necessary authorizations such as city encroachment permits. It’s all part of our commitment to offering the safest and most efficient temporary traffic control in Southern California. Do you need reliable private road traffic control services? Roadway Construction Service is available now to assist you – always at your convenience. Reach out to us any time. We’ll be happy to provide additional information and answers to all your questions.